I often get asked the following questions: Why have two open accounts: PRT CFDs and PRT Futures? And therefore why trade Futures and CFDs simultaneously? 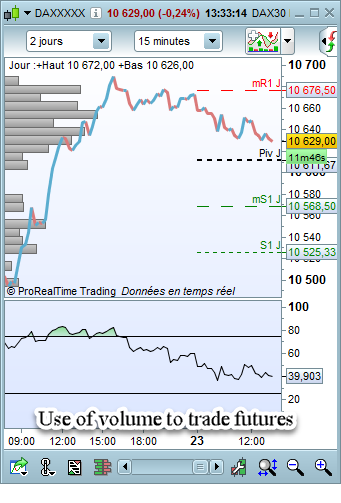 What are the reasons for trading Futures and CFDs simultaneously? Why have a Futures Broker and a CFD Broker at the same time? Why have you chosen PRT Futures and PRT CFD? As you might have noticed, the title of this blog has not changed since it began in 2010. It's the Blog of a CFD and Futures trader. I have now been trading Futures for 12 years and CFDs at the same time for 5 years. I try to take the best of each and this provides a lot of security for my trading. You need to take advantage of each product's benefits. Without going into details, CFDs offer traders an extensive range of products, and they offer micro lots for beginners while Futures are more "professional" and provide traders with more information. Indeed, Futures provide data that CFDs do not pass on, notably including trading volumes and the depth of the order book. Those two indications are very useful for traders and particularly for scalpers. In addition, if you want to make trading a professional career you need to know that if you approach a Hedge Fund or other financial institution, the only evidence of your skills that they accept is your Futures track record. Futures and CFDs should not, therefore, be seen as competing products, but simply as complementary, which together put the odds in your favour. Develop two distinct intervention strategies on the same instrument in different time zones (scalping and day trading on the system best suited to your strategy and hedging the second and/or swing trading.). 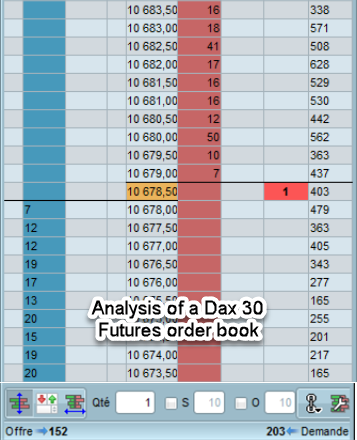 For example, by reading this Dax 30 Futures order book, we can see that the pressure is on bids (152 bid lots against 203 ask lots). In addition, there are difficult ask levels to pass (50 lots at 10680, 41 lots at 10682.50). Their proximity shows a strong concentration of sellers. This information, which we don’t have with CFDs, enables us to identify the best levels to position purchases and sales of CFDs and Futures. A few seconds after this screen shot, the Dax 30 started to decline. The CFD cash and Futures prices are different. This gives us more information about zones of support and resistance. Using support and resistance information for CFDs and Futures, I multiply my trade and possible gain opportunities by two. In addition, it enables me to have a better understanding of why Futures or CFDs "stagnated" in the middle of nowhere. This corresponds to support or resistance for Futures or CFDs. Therefore, this additional information is very useful for trading. It allows you to identify in advance thinly defended areas and exploit this information on CFDs. That is what I call the Volume Gap. In the example, my short buyback zone had a Volume Gap between 10580 and 10600. This level was reached at the end of the session. There are other reasons, such as using time the futures market is closed to trade overnight CFDs positions, Hedging, Straddle, coverage because CFDs quote 24/7 which is not the case for Futures etc. There are many possibilities, I will give more details in future articles, but you have a view of the main possibilities. But we must not forget security! Having a CFD and a Futures Broker provides an essential degree of security for trading. If I'd had a CFD broker at the time, I could have instantly sold Nikkei CFDs at the last known transaction price. With of course, a higher spread. But that is fantastic security. No matter what happened, my €2,000 gain would have been secure. The price variations on re-quotation would be offset on the two accounts. I insist on this point, if there is a problem on Euronext (this happened to me several times), CME, CBOT etc., it is useless to have two different Futures brokers. You will have the same problem, no quotations, you will be powerless. If you have an additional, reliable CFD broker, they will continue to quote. And of course, if your CFD Broker has a technical problem, your Futures Broker will be your emergency backup. If there is a problem, I have two permanent options for placing orders (computer / smartphone). In addition, I also have two possible internet connections (ISP / 4G) and an uninterruptible power supply (UPS) against electrical cuts. The indispensable addition to all these safeguards is to have a CFD Broker and a Futures broker to protect my capital in case of adverse events. I have set out detailed reasons in these articles: Why I trade with ProRealTime CFD? and Why I trade with ProRealTime Futures? In summary, I chose ProRealTime trading because they are allied with the two world leading brokers in their field, who I have traded with for years and years (2006 and 2011). 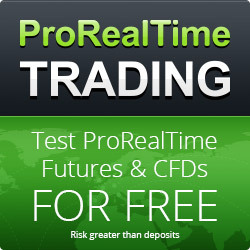 IG for CFDs (ProRealTime CFDs is the IG broker but with exclusive benefits). Click here to learn more. Interactive Brokers for Futures (ProRealTime Futures uses Interactive Brokers but with exclusive benefits). Click here to learn more. My particular benefits include the most complete version of ProRealTime, the Premium version. This enables me to submit my CFD and Futures orders with the same interface for dealing, the same charts, etc. It is remarkably efficient for submitting CFD and Futures orders, you are in the same environment. In addition, I benefit from an exclusive Futures and CFD customer service. It therefore saves considerable time which enables me to concentrate fully on the heart of the business, trading. If you only have a CFD account, you could possibly be more comfortable with a Futures account. And conversely if you only have a Futures account, you might be more secure with a second CFD account. If you only take two things from this, remember: SAFETY AND EFFECTIVENESS. Regardless of what you principally trade (CFDs or Futures), you absolutely must have your own counterparty in case of technical problems. Also, you can benefit from the best prices and the flexibility of having two accounts, CFDs and Futures. And the ideal, for me, is to have these two accounts, CFDs and Futures, with ProRealTime Trading. Actually, you then have the same customer service (saving time and energy) and the same interfaces for submitting orders, and the same charts (effective). This prevents wasting valuable time continually re-adapting between the specific trading platforms of two different brokers, a source of fatigue and often poor trade transfers. 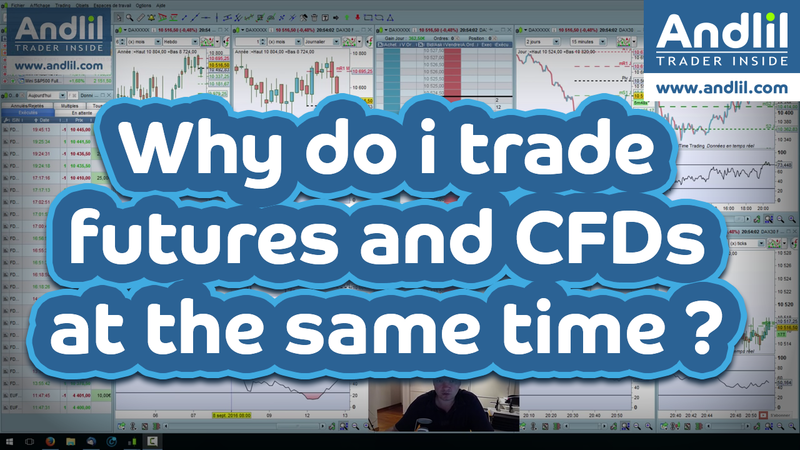 1 Comment for Why do I trade Futures and CFDs at the same time? Good post! CFDs and Futures trading are both forms of derivatives trading. A futures contract is an agreement to buy or sell the underlying asset at a set price at a set date in the future, regardless of how the price changes in the meanwhile.